One of the highlights of my year is the annual “Spicy Food Festival” that takes place in my neighborhood. Aside from adding some great music and delicious food, it’s also really good for my health. It’s long been said that “spicing up your life” can lead to happiness and longevity. When you’re stuck doing the same old thing day in and day out, year after year, things can get a little boring. But when you’re interested and motivated, you can recapture the energy that’s been missing. But adding a little excitement isn’t the only way to improve your health. New research is showing that adding some spice—in the most literal sense—might lower your risk of death. As it turns out, that “suicide” hot sauce might extend your life instead! The Mediterranean diet has been heavily studied in recent years and its benefits for heart health and weight management have been clearly identified. But it’s not for everybody, and it certainly isn’t the only show in town. If you’d like to replace your olive oil and grilled chicken with a spicy chicken curry, you can likely experience some similar health benefits. There’s been plenty of research to support the beneficial effects of spices—specifically capsaicin (a main component in chili pepper). 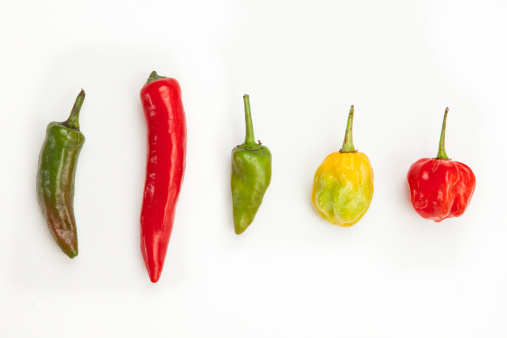 Capsaicin is noted to have antioxidant, anti-obesity, anti-inflammatory, and anti-cancer effects, so it makes sense to think that a diet high in spicy food is also great for your health. People who enjoyed spicy food more frequently appeared to have a lower risk of dying from cancer, heart disease, and respiratory diseases. Although this study was observational in nature and does not prove cause and effect, its results are quite valuable. It reinforces the fact that there is more than one way to eat healthy, and that various sources of health-promoting foods can offer similar benefits. You can diet and experience benefits by eating fresh food that’s tailored to your taste. Better yet, you can add some spice to all those veggies to give them a little flavor and an extra health boost—no more boring salad! “Regular consumption of spicy foods linked to lower risk of early death,” Science daily web site, August 4, 2015; http://www.sciencedaily.com/releases/2015/08/150804202650.htm.